The SR560 has a differential front end with 4 nV/√Hz input noise and an input impedance of 100 MΩ. Complete noise figure contours are shown in the graphs below. The SR560's inputs are fully floating (BNC shields are not connected to chassis ground). Both the amplifier ground and the chassis ground are available on the rear panel for flexibility in grounding the instrument. Input offset nulling is accomplished by a front-panel potentiometer, accessible with a small screwdriver. In addition to the signal inputs, a rear-panel TTL blanking input lets you quickly turn off and on the instrument's gain. This is useful in preventing front-end overloading. The gain turns off 5 µs after the TTL level goes high, and back on again within 10 µs after the TTL signal goes low. Two insulated output BNC connectors provide 600 Ω and 50 Ω outputs. Both are capable of driving 10 Vpp into their respective loads. 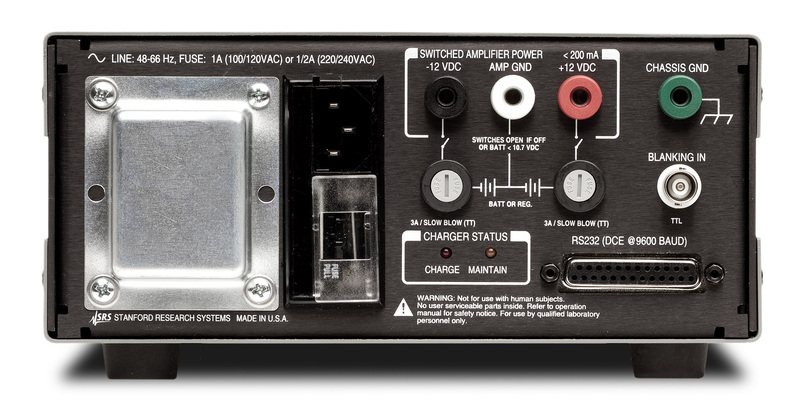 Two rear-panel power supply outputs provide up to 200 mA of ±12 VDC referenced to the amplifier ground. The outputs provide clean DC power for use as a bias source. Gains are selectable from 1 to 50,000 in a 1-2-5 sequence. An adjustable gain feature lets you specify the gain as a percentage of any of the fixed gain settings with 0.5 % resolution. Gain can be selectively allocated before the filters to optimize noise performance, or after the filters to reduce susceptibility to overloads. 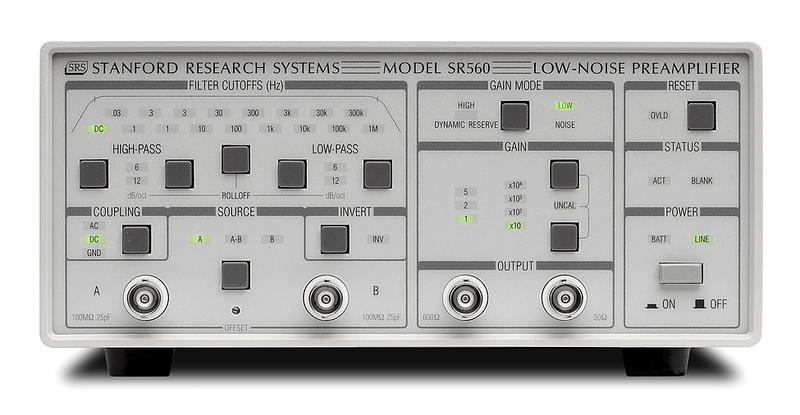 The SR560 contains two first-order RC filters whose cutoff frequency and type (HPF or LPF) can be configured from the front panel. Together, the filters can be configured as a 6 or 12 dB/oct rolloff low-pass or high-pass filter, or as a 6 dB/oct rolloff band-pass filter. A filter reset button is included to shorten the overload recovery time of the instrument when long filter time constants are being used. Filter cutoff frequencies can be set in a 1-3-10 sequence from 0.03 Hz to 1 MHz. Three internal, rechargeable, lead-acid batteries provide up to 15 hours of battery powered operation. An internal battery charger automatically charges the batteries when the unit is connected to the line. The charger senses the battery state and adjusts the charging rate accordingly. Two rear-panel LEDs indicate the charge state of the batteries. When the batteries become discharged, they are automatically disconnected from the amplifier circuit to avoid battery damage. The microprocessor that runs the SR560 is "asleep" except during the brief interval it takes to change the instrument's setup. This ensures that no digital noise will contaminate low-level analog signals. The RS-232 interface allows listen-only communication with the SR560 at 9600 baud. Up to four SR560s can be controlled from a single computer, with each SR560 being assigned a unique address. A "Listen" command specifies which SR560 will respond to commands on the RS-232 line. All functions of the instrument (except power on) can be set via the RS-232 interface. The RS-232 interface electronics are opto-isolated from the amplifier circuitry to provide maximum noise immunity. Gain 1 to 50,000 in 1-2-5 sequence. Vernier gain in 0.5 % steps. Signal filters 2 configurable (low-pass or high-pass) 6 dB/oct rolloff filters. -3 dB points are settable in a 1-3-10 sequence from 0.03 Hz to 1 MHz. Gain allocation High Dynamic Reserve — Gain is increased after the signal filters to prevent overloading. Low Noise — Gain is increased before the filters to improve noise figure. Filter reset Long time constant filters may be reset with front-panel button. Power 100/120/220/240 VAC, 6 watts charged, 30 watts while charging. Internal batteries provide 15 hours of operation between charges. Batteries are charged while connected to the line.